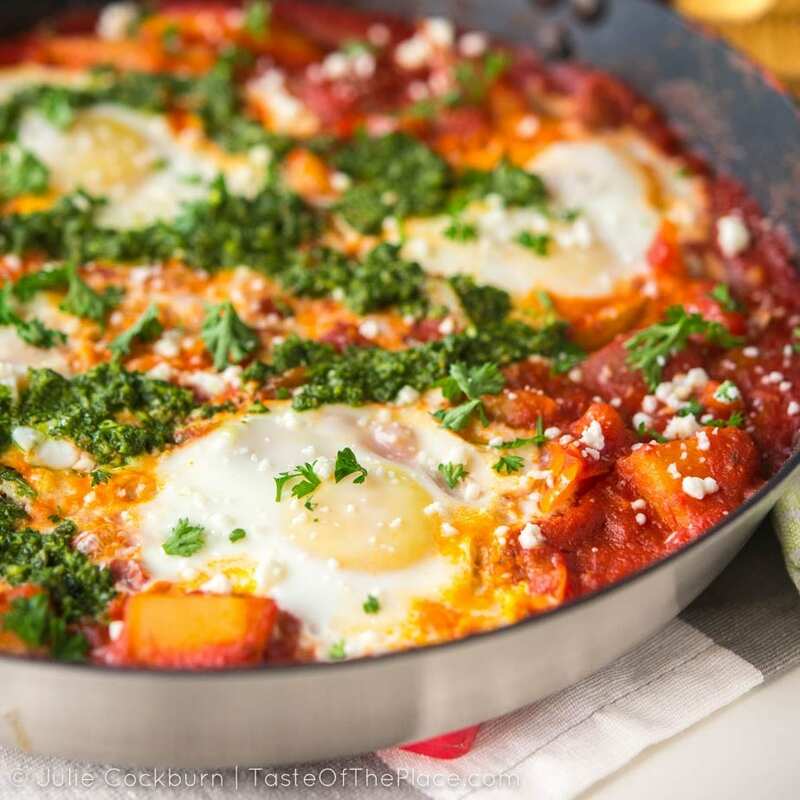 Shakshuka is a simple, easy-to-make, one-pan meal of eggs poached in a savory, spicy tomato and pepper sauce. It’s just as tasty for breakfast as it is for dinner, and makes a satisfying dish any time of day. Happy day, my friends! Are you ready to dive into another tasty dish? This delicious recipe comes to us from North Africa and the Middle East, where it is especially popular in Israel. 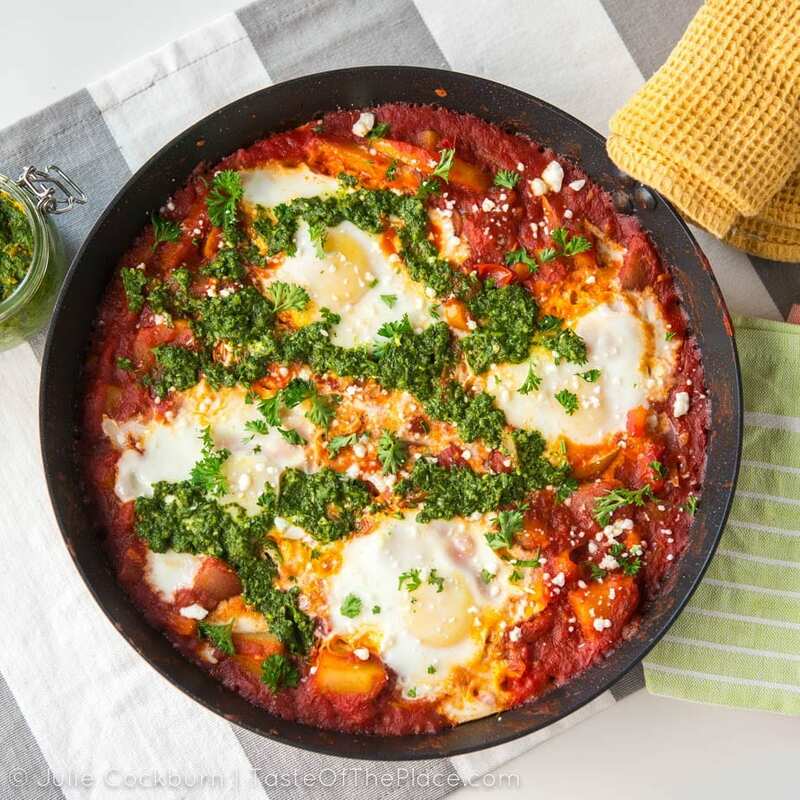 Shakshuka is a savory combination of tomatoes, peppers and eggs that is equally comfortable on the table for breakfast, dinner, lunch, or brunch. All of the ingredients are easy to find (you probably already have everything you need on hand), plus it comes together quickly, making it a great choice for a fresh weeknight meal that you can throw together in a snap. It’s loaded with flavor, from earthy cumin and paprika, to roasty tomatoes and peppers, to sharp and salty feta. The addition of potatoes in my version of shakshuka makes it extra satisfying. Just add some bread on the side, and maybe a green salad, and you’ve got a quick, easy, and healthy meal! Shakshuka most likely originated in North Africa, Tunisia specifically, and was brought to Israel by migrating Jews. 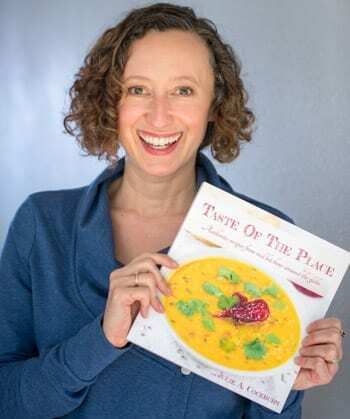 It has become exceedingly popular in Israel, where it can be found on menus in restaurants and at street food vendors throughout the country. As with most things in the North African/Middle Eastern part of the world, whether shakshuka can actually be called an Israeli dish is a hotly debated topic. Debates about origins aside, everyone can agree that this dish is absolutely delicious! There are many, many recipes for shakshuka out there, but the basic idea is generally eggs poached in a savory combination of tomatoes and peppers. When I was developing my version, I came across a recipe that called for blistering a few cherry tomatoes in hot oil at the start of cooking. This seemed like a great way to add another layer of flavor to the dish, so I took it one step further and opted to blister both the cherry tomatoes and the bell peppers. I’m glad I did – it adds a subtle, roasty depth that supports and accents all that bright flavor from the crushed tomatoes. By the way, that particular recipe I mentioned can be found on the Panna Cooking membership website at PannaCooking.com/recipes/shakshuka-alon-shaya. This dish is all about the tomatoes. Use the best quality crushed tomatoes you can get. I know, I know, it costs twice as much (if not more) to buy the good stuff, but seriously, it makes a huge difference in this particular dish. If you are lucky enough to have really good fresh tomatoes on hand, then give this dish a go with 2 cups finely diced. It will be even delish-er! 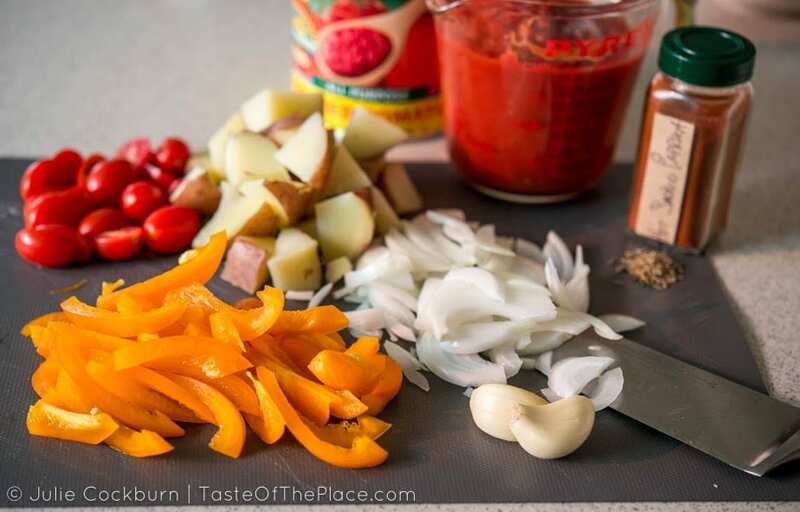 I call for zhoug as a garnish for the shakshuka (say that 5 times fast!). 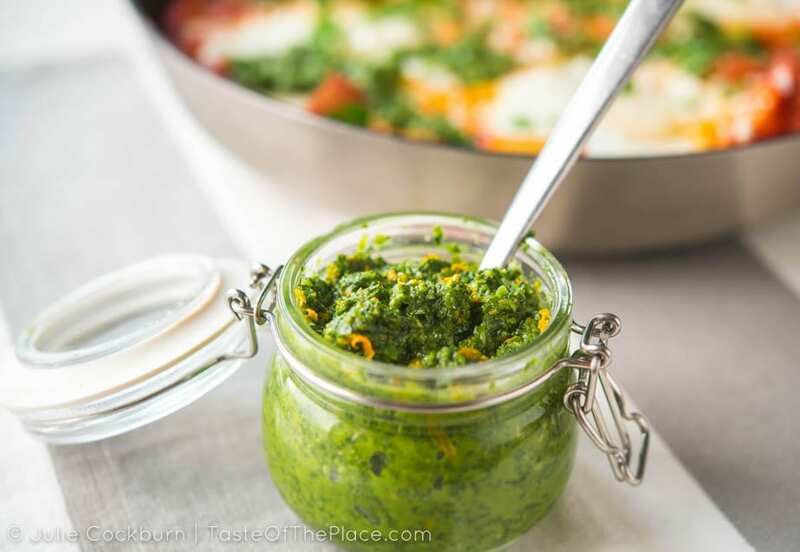 Zhoug is a fresh and fiery cilantro based sauce that is a perfect accent to the savory tomatoes and eggs. You can grab my recipe at TasteOfThePlace.com/Zhoug. Another tasty finishing option would be harissa. Even a fresh pesto would be tasty. So many options! Shakshuka is a simple, easy-to-make, one-pan meal of eggs poached in a savory, spicy tomato and pepper sauce. It's just as tasty for breakfast as it is for dinner, and makes a satisfying dish any time of day. Heat the oil in a large (about 10 inches or so wide), non-stick skillet over medium high heat, until just barely starting to smoke. 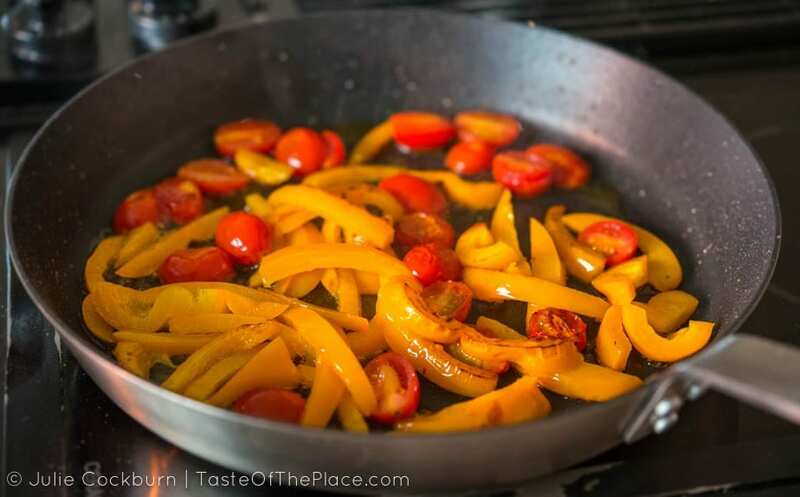 Carefully add the cherry tomatoes and bell peppers to the hot oil. They will splutter and splash, so be aware and be careful. Cook for several minutes, tossing once or twice, until they begin to blister and brown. Add in the garlic and cumin seeds, and stir constantly for about 15 seconds or until the garlic becomes fragrant. Add in the sliced onions, and continue cooking, stirring frequently, until the onions are tender, 3 or 4 minutes. Gently stir in the potatoes, crushed tomatoes, smoked paprika, and a big pinch of salt. Reduce the heat to medium, and simmer, stirring occasionally until the mixture thickens slightly, about 5 minutes. Give the tomato mixture a taste before moving on to the next step, and add additional salt if desired. Use a ladle or a spoon to make 4 shallow divots in the tomato mixture. Crack one egg into each divot, cover the skillet, and cook until the egg whites are set, but the yolks are still runny, about 5 minutes. Remove from the heat. You can test the eggs for doneness by gently poking with your finger - the whites should feel firm, and the yolks should feel soft. If you like your eggs more well done, simply leave on the heat for longer. Sprinkle the parsley and feta on top, and dollop with a spoonful or two of zhoug. Shakshuka is a very flexible dish, so feel free to adjust to your taste. Leave out the spices. Add more spices. Skip the cheese. Forget the potatoes. Whatever you like, it's going to be delicious. I call for zhoug as a garnish for the shakshuka. Zhoug is a fresh and fiery cilantro based sauce that is a perfect accent to the savory tomatoes and eggs. You can grab my recipe at TasteOfThePlace.com/Zhoug. Another tasty finishing option would be harissa. Even a fresh pesto would be tasty.